This article explains the characteristics of the latex swim cap, as well as its advantages and disadvantages. It also highlights some of the differences with other kinds of swim caps, namely silicone and lycra swim caps. Knowing this can be helpful if you are a beginner and wonder which kind of cap you should get. Historically, the latex swim cap was one of the first kinds available. It was available as early as in the 1920s and is still popular to this day. It comes in an extensible rubber-like material. It is thinner than its silicone counterpart. It has a uniform color (except maybe for a supplemental printed logo), unlike a silicone swim cap or lycra swim cap which can feature several colors per cap. It has a matte finish when dry, whereas a silicone cap is shinier. It has a peculiar smell, like the smell of balloons. Its most significant advantage is that it is inexpensive yet it serves its purpose well, which is to both keep the hair out of the face and to protect the hair from swimming pool chemicals, especially chlorine. The latex swim cap has a tight fit because of its thinness. Consequently, it produces less drag than other types of swim caps. This also explains why a lot of competitors like them. Because it is so thin, it constricts your head less than a silicone swim cap and is more comfortable to wear. It is also often easier to put on than a silicone or neoprene swim cap (Note: this applies when the swim cap is wet and your hair too! Putting on a dry swim cap on dry hair is much more difficult. If you want to do this, you might be better off using a lycra swim cap). It can be written on with a marker. This can be useful for example in triathlons where you need to write your starting number on the cap. However, you need to have a swim cap with a light color to do this. Another advantage of its thinness is that it’s easier to put two latex swim caps one on top of the other. Some swimmers like to do this so they can hide the strap of the swim goggles between the two caps and in doing so reduce drag yet feel comfortable. One of its most significant problems is that certain people are allergic to latex. This was one of the reasons that lead to the development of silicone swim caps. It has the shortest lifespan of all types of swim caps. One reason for this is that it tears faster because of its thinness. Another reason for this is that after a while the latex gets attacked by the chlorine found in most swimming pools. When that happens, the cap starts to get viscous and sticky. Because of its thinness, it offers less isolation in cold water than other types of caps. As mentioned above, a latex swim cap comes only in one color per swim cap. So if you want to have a funky colored swim cap, you’ll most likely have to pick a silicone or lycra one. The manufacturing process only allows for simple shapes. So if you want to have a swim cap with a more interesting shape, such as one of those funny ones with shark fins, you’ll have to resort to other materials, which most likely will be silicone. 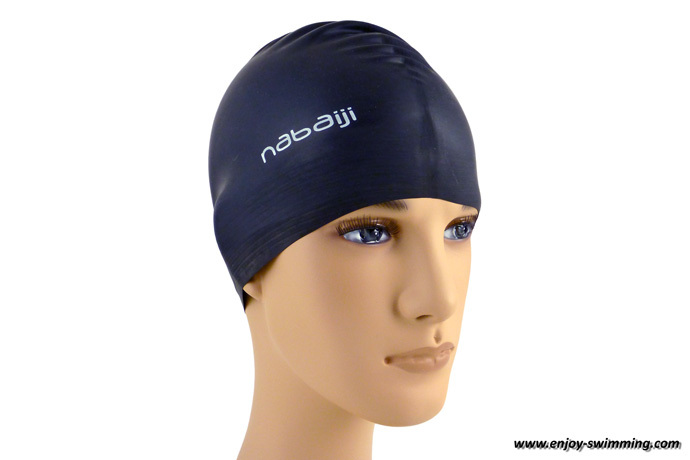 If you aren’t allergic to latex and want to have a swim cap that gets the job done, is inexpensive, comfortable and has a discreet look, then a latex swim cap might be a perfect fit.